Cuppa - Malaysia's Number 1 Online Coffee and Tea Store: Why Bodum® French Press? Green is not a word that normally comes to mind when making a cup of coffee. We hear about forest preservation and conservation in the cultivation and replanting stage but after that? Not much, especially not in the age of convenience and the recent proliferation of capsule coffee. This is not that big of an issue if proper recycling program is put in place and an incentive is given to consumers to recycle these waste products. However, I have digressed. Let's get back to "Why Bodum French Press?" and how does that relate to being green? 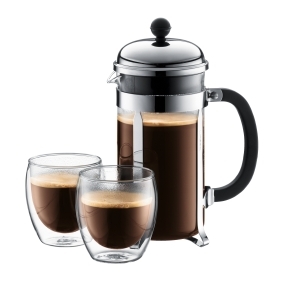 "Coffee has always taken center stage at Bodum® and the French press remains our biggest star. Turns out the French press has always been the greenest way of brewing coffee - long before "green" even existed. In fact, it's official: Slate magazine says the French press is the greenest way to an excellent cup of coffee. It's pure and simple which is exactly the reason why coffee tasters use this method to determine the quality of coffee beans. The materials of the French press (glass and stainless steel) are completely taste-free so nothing comes between your ground coffee beans and the hot water. The French press literally generates no waste at all, no metal capsules, no paper, no nothing. You only boil as much water as you need - and there you go. We all know plastic water bottles are an environmental problem, but have you thought about all those metal capsules left by other coffee machines? They generate more waste than espresso. With the Bodum® French press, it's just glass, water and coffee - brewing doesn't get any purer." And if you have houseplants, you can sprinkle used grounds on your plants or add them to your compost. The used coffee grounds provide nitrogen supplement for your plants. What is the cheapest espresso machine that makes great coffee?